Harivansh Rai Shrivastav alias Bachchan (Hindi: हरिवंश राय बच्चन) (27 November 1907 – 18 January 2003), was a noted Indian poet of Chhayavaad literary movement (romantic upsurge) of early 20th century Hindi literature.Born in a Srivastava Kayastha family, in the village of Babupatti (Raniganj) in the district of Pratapgarh ,he was also a famous poet of the Hindi Kavi Sammelan. He is best known for his early work Madhushala (मधुशाला). He is also the father of the noted Hindi film actor, Amitabh Bachchan. In 1976, he was honoured with the Padma Bhushan for his immense contribution to Hindi literature. Born in a Srivastava Kayastha family, in Allahabad while his ancestors belonged to the village of Babupatti (Raniganj) in the district of Pratapgarh, U.P. near Allahabad in the United Provinces (modern Uttar Pradesh) he was the eldest son of Pratap Narayan Shrivastav and Saraswati Devi. He was called bachchan (meaning Kid at home). He received his formal schooling in a municipal school and followed the family tradition of attending Kayastha Paathshaalas (कायस्थ पाठशाला) to learn Urdu as the first step to a career in law. He later studied at the Allahabad University and Banaras Hindu University. In this period, he came under the influence of the independence movement, then under the leadership of Mahatma Gandhi. Realizing that this was not the path he wanted to follow, he went back to the university. However from 1941 to 1952 he taught in the English Department at the Allahabad University and after that he spent the next two years at St Catharine's College, Cambridge, Cambridge University doing his doctoral thesis on W.B. Yeats. It was then, that he used ‘Bachchan’ as his last name instead of Srivastava. Harivanshrai’s thesis got him his PhD at Cambridge. He is the second Indian to get his doctorate in English literature from Cambridge. After returning to India he again took to teaching and also served at All India Radio, Allahabad. In 1955, Harivanshrai shifted to Delhi to join the External Affairs Ministry as an officer on Special duty and during the period of 10 years that he served he was also associated with the evolution of Hindi as the official language. He also enriched Hindi through his translations of major writings. As a poet he is famous for his poem Madhushala (a bar selling alcoholic drinks). Besides Omar Khayyam’s Rubaiyat, he will also be remembered for his Hindi translations of Shakespeare’s Macbeth and Othello and also the Bhagvad Gita. However in Nov 1984 he wrote his last poem ‘Ek November1984’ on Indira Gandhi’s assassination. Harivanshrai was nominated to the Indian Rajya Sabha in 1966 and government gave him the Sahitya Akademi award three years later. In 1976 he was honoured with the Padma Bhushan for his immense contribution to Hindi literature. He was also honoured with the Saraswati Samman, the Sovietland Nehru Award and the Lotus Award of the Afro-Asian writers’ conference, for his unique contribution to the world of letters. But if ever asked to introduce himself, he had a simple introduction: Mitti ka tan, masti ka man, kshan-bhar jivan — mera parichay. (A body of clay, a mind full of play, a moment’s life - that is me.). 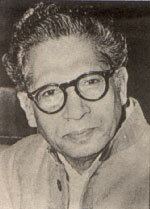 Bachchan died on January 18, 2003, at the age of 95, as a result of various respiratory ailments. His wife Teji Bachchan died six years later in 2007, at the age of 93. From 1941 to 1952 he taught English Literature at Allahabad University and then spent two years at Cambridge University, at St Catharine's College. There he studied with the famous English literature don, Thomas Rice Henn, and received a doctorate in English Literature for his work on the Irish poet W.B. Yeats and Occultism. It was there that he used Bachchan as his last name instead of 'srivastava. He was the second Indian to get his doctorate in English literature from Cambridge University. After returning to India, he taught briefly and then worked as a producer for All India Radio, Mumbai. In 1955, he moved to Delhi to join the Ministry of External Affairs of the Government of India and there he was closely involved with the evolution of Hindi as the official language of India. “ Mitti ka tan, masti ka man, kshan-bhar jivan– mera parichay.